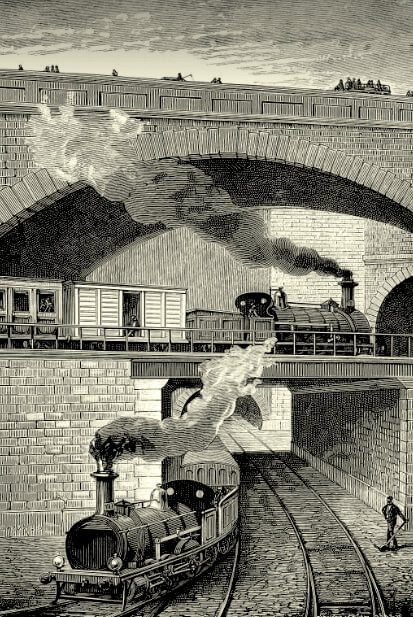 Metropolitan railway at Clerkenwell Tunnel in London. Illustration in Louis Figuier Les Nouvelles Conquêtes de la Science volume 2 (1884) page 513. Although Mrs Jane Carolan had not wanted to take a lodger, at least it was some comfort to her that the young man occupying a room in her house at 16 Union Road in Clapham was respectable. A solicitor’s clerk, he was always well-dressed, and he seemed intent on self-improvement, if the large number of library books he borrowed was anything to go by. 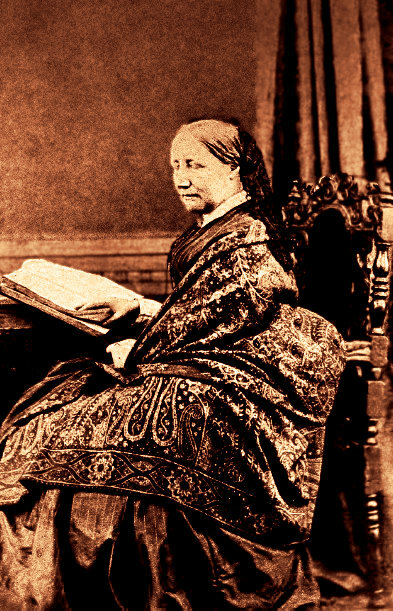 At least he brought in some extra funds after what had been a very trying period for Mrs Carolan: first her mother had died, and shortly after, in May 1861, her husband James Ward Carolan, a custom’s house clerk, had been committed to the Camberwell Lunatic Asylum. 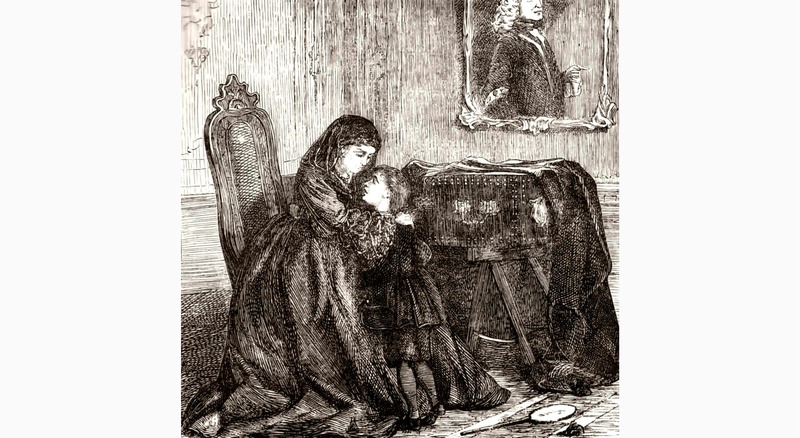 Only seven months later he too died, leaving her £600 and two children to support, twelve-year-old Emma and nine-year-old James. So it was with dismay that she found Detective Sergeant White at her door, demanding to see the lodger’s room. Some weeks before, on Saturday the 11th of January, now 1862, a young bookseller-librarian aged twenty-nine by the name of William Henry Moxon was walking down Great Turnstile, a lane leading from Lincoln’s Inn Fields to High Holborn. He stopped outside No. 15, a second-hand bookshop lodged between a tobacconist and a pastry cook’s, and run by one Richard Kimpton. 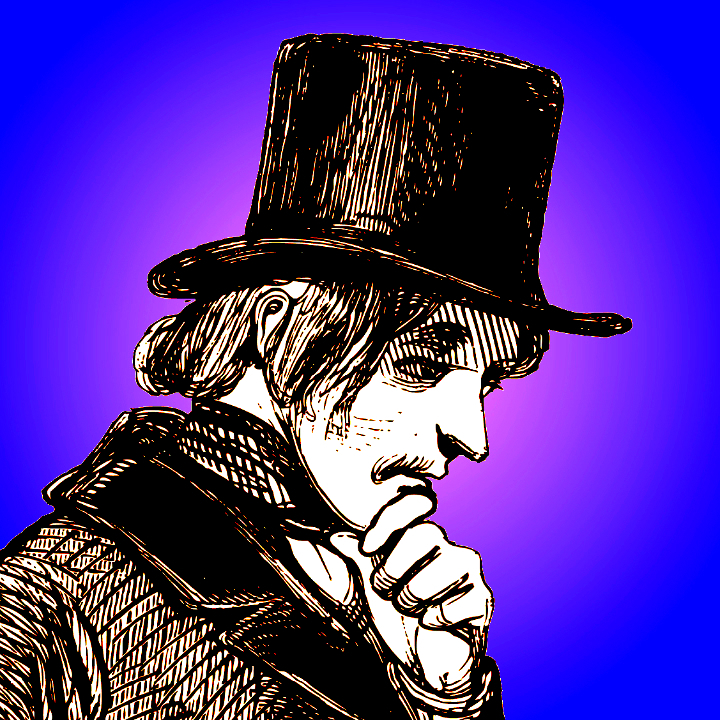 William couldn’t help taking a professional interest in Kimpton’s stock, as he had worked as a bookseller for twelve years, first in York, and then in London at Bull’s Lending Library as head of the sales department. So it was with no little indignation that he saw that some of the books for sale were bound in the same distinctive bindings as all the Bull’s books. Even worse, the identifying numbers and labels had been removed. Quick as a flash Moxon ordered Kimpton to remove the books from sale, and he went to get the police. 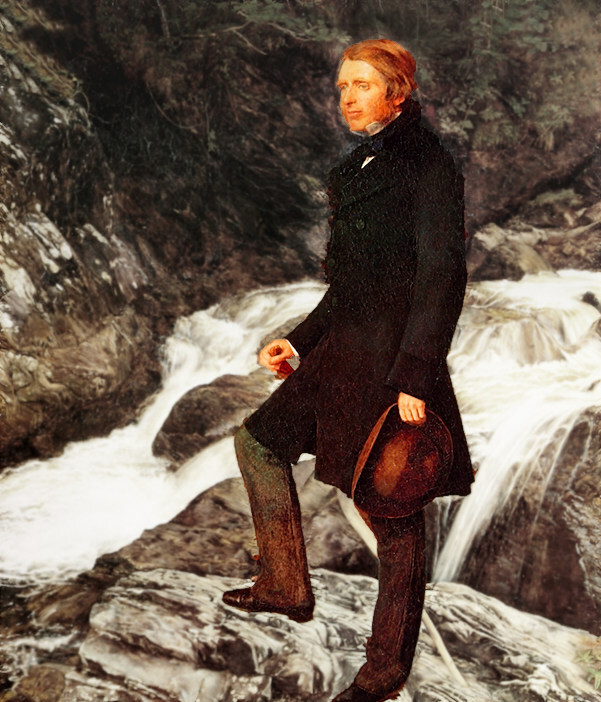 John Ruskin by John Everett Millais. Dated 1853 to 1854. Richard Frederick Kimpton, who lived above the shop with his wife and seven children, was interviewed by a policeman. He explained that on Thursday 2nd January he had received four books and a letter via the Parcels Delivery Company. The letter, from Mr Lionel R J Foster of Chertsey, offered him the books in exchange for three guineas. Kimpton thought this a little steep, so he said that he would take them for £2 15s. Foster agreed, and asked Kimpton to pay by post. After Moxon alerted him to the fraud, Detective White took a train to Chertsey in order to interview Mr Foster, making his first port of call the local Post Office to find out where Mr Foster lived. The post master explained that Mr Foster hadn’t yet moved into the district, and had asked that any mail addressed to him be forwarded to the Post Office at 42 Long Acre in Covent Garden. Sergeant White immediately took the train back, and arrived in Covent Garden in time to see a man collect the mail for Lionel Foster at six in the evening. When challenged the young man denied being Foster, but said he was his friend, and that his name was Charles Story—although his surname on some documents is Storey. On the way to the police station he was seen trying to throw away a letter from Bull’s asking him to return the library books. When the case came to court, Mr Moxon, the keen-eyed Yorkshireman, explained that young Story had taken out a fifteen shilling quarterly subscription to Bull’s Lending Library, which was just down from Cavendish Square at 19 Holes Street—where John Lewis is now. The subscription allowed him to borrow six of the older books held by the library, and he selected Ruskin’s Seven Lamps of Architecture, the fourth and fifth volumes of the same writer’s History of Modern Painters, one of Paul Du Chaillu’s many books about exploration in Africa, The Ingoldsby Legends, and the first volume of Mrs Gaskell’s North and South. If new, the books would have been worth six pounds, so a good deal of trust was involved in the transaction. The solicitor for the well-dressed young man tried to suggest that he had done nothing wrong, as the books weren’t due to be returned. But it turned out that book theft wasn’t Story’s only vice. 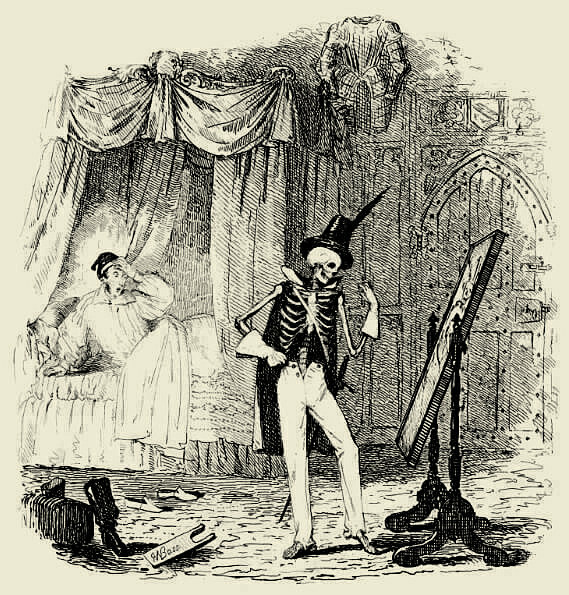 Image illustrating “The Spectre of Tappington” by Richard Harris Barham in Bentley’s Miscellany volume 1 (1837) between p.190 and p.191. On 9th November 1861 H J and D Nicholls, tailors of 225 Regent Street, received an order in the post from E Graham Duke Esq of Herne Bay in Kent. The discerning Mr Graham Duke sent his measurements and detailed instructions for clothes he wanted made: a beaver coat with a cape lined with quilted silk, a black superfine mourning coat, diagonal angola trousers and matching waistcoat, and a waistcoat made of white marsala. As the tailors did not have the quilted silk lining, they posted seven samples of available patterns to Herne Bay. Mr Graham Duke part-paid for the clothes by sending half a ten pound note—the other half literally to follow later—and a cheque for £3 7s in the name of Edwin Browne; the remainder would be paid on receipt of the clothes. The clothes were promptly parcelled up and sent by train to Sturry Station, a couple of miles outside Canterbury and near Herne Bay. But, to the alarm of Messrs Nicholls and Nicholls, information came from the bank that the cheque was a fake. Acting quickly, they sent a telegraph to the station master at Sturry, asking him to hold the parcel. Too late! A slim young man in an Inverness coat, which was a coat with a cape over the top reaching to the end of the sleeves—not to be confused with Sherlock Holmes’s favoured sleeveless Inverness cape—had already collected them and had then proceeded to take the next train to London. Back to Mrs Carolan’s house in suburban Clapham on 11th January 1862, conveniently close to the railway. 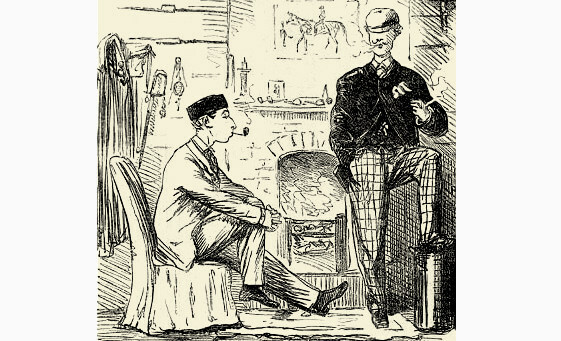 Searching the lodger’s room, Sergeant White found a veritable treasure trove of evidence: correspondence from other subscription libraries, including Mudie’s and Hookham’s of Bond Street, to a Mr Villiers Villiers of Weybridge in Surrey; a letter addressed to the sartorially splendid E Graham Duke in Herne Bay, helpfully redirected to the post office at 2 Greek Street in Soho, containing seven cloth samples from Nicholls as well as an optimistic invoice; two coats, a pair of trousers and two waistcoats. Story was fortunate to be acquitted of defrauding Nicholls on a technicality. But he was found guilty of stealing library books from Bull’s, and sentenced to twelve months imprisonment. What happened to him next, I’m not sure. If he actually was Charles J A Story, as is reported in the 1861 census, then he was the son of a solicitor, and later emigrated to Australia, where he too worked as a solicitor, dying in 1880 at the age of thirty-seven. 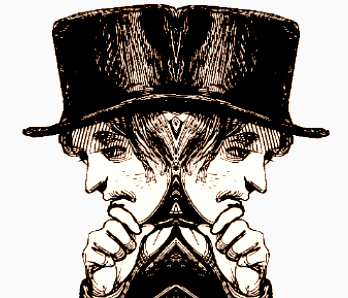 But given his propensity for adopting other names—Foster, Graham Duke, Villiers Villiers—who knows who he really was? As for the other characters in this tale, Jane Carolan died only a few months later. Mr Kimpton had retired to Red Hill in Surrey by 1871, dying a year later at the early age of 46. William Henry Moxon started his own business near the Royal Docks in Plaistow, with his sister as assistant bookseller, and lived to about 1893. My principal source for the story of the light-fingered clerk was a report that was published in an 1862 newspaper. 12 months in prison for stealing a couple of books!! Seems incredible now but it could have been worse – he might have been transported for theft.